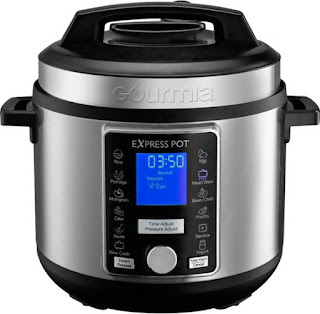 Today only, while supplies last, get this Gourmia - 6-Quart Pressure Cooker with Auto Release for ONLY $79.99 (Retail $199.99)! Reduce wait times with this 6-quart Gourmia SmartPot pressure cooker. Its multifunction capabilities let you slow cook, saute, brown or steam dishes, and the 13 preset programs ensure delicious soups and sides are just a touch away. The 12-level safety system of this Gourmia SmartPot pressure cooker keeps the lid secured until internal pressure stabilizes.